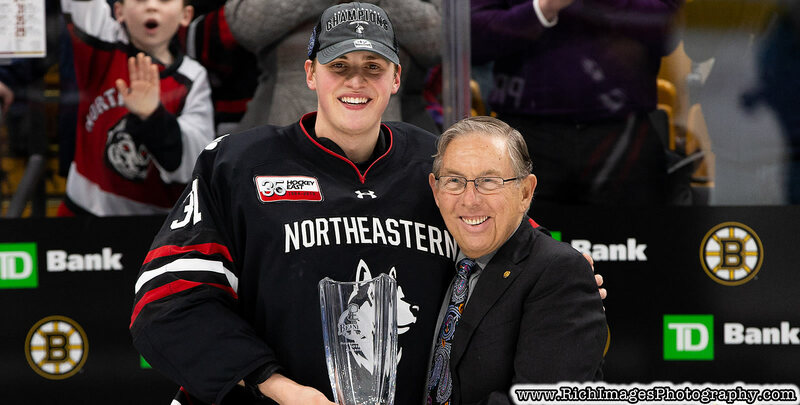 BOSTON - For the first time since 1984 and 1985, the Northeastern men's hockey team is in possession of consecutive Beanpot championships as the 14th-ranked Huskies held off Boston College, 4-2, during Monday's title game at TD Garden, laying claim to their second straight title and sixth such trophy during program history. 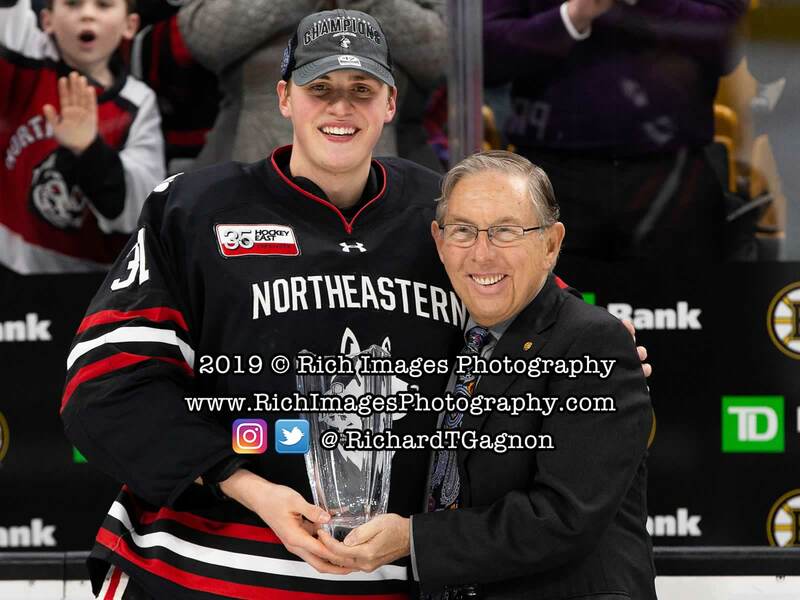 Sophomore goaltender Cayden Primeau blanked the Eagles through two periods and made 33 saves en route to winning his second consecutive Eberly Award and being named the 2019 Beanpot Most Valuable Player. 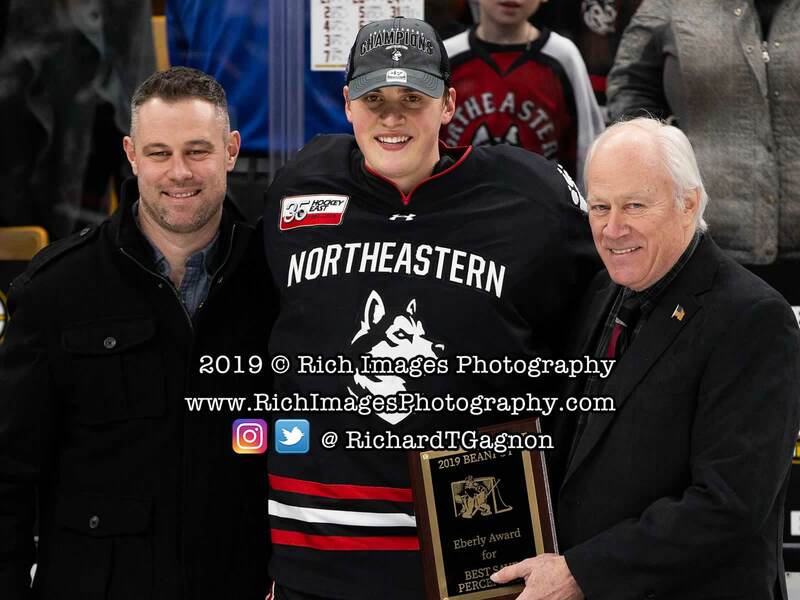 Primeau - who saved 59 of the 62 shots he faced during the tournament - joined the company of Bruce Racine (1985, 1988), Marc Robitaille (1997, 1998) and Brad Thiessen (2008, 2009) as the NU netminders to win multiple Eberly Awards. 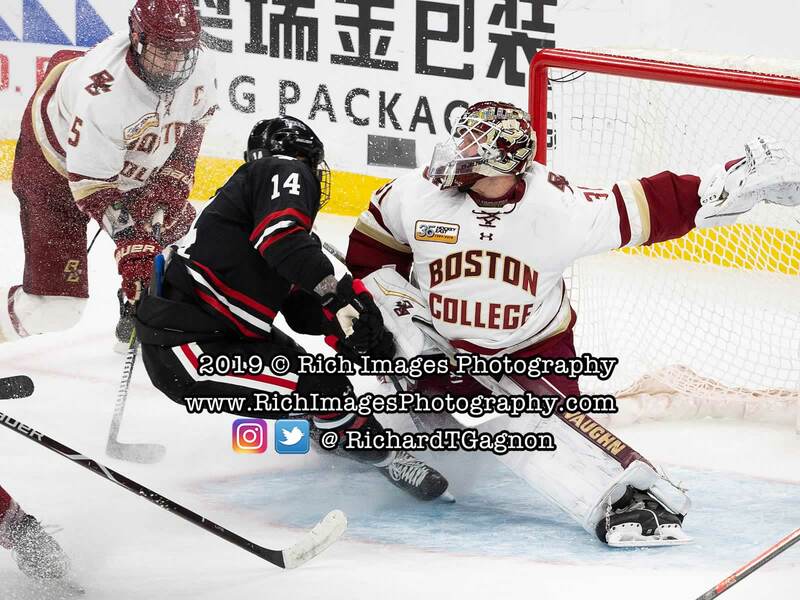 After a lengthy review confirmed there was no BC goal six minutes into the game, Northeastern (17-9-1) hopped onto the scoreboard first with 39 seconds remaining in the opening period, when Austin Plevy poked the puck out from the control of the Eagles' goaltender, Joseph Woll, for his third goal of the season (first career Beanpot goal). Twelve seconds earlier, Zach Solow had won the faceoff from the right dot that prompted Jordan Harris to skate the puck inside the blue line, firing once to Woll's stick side. 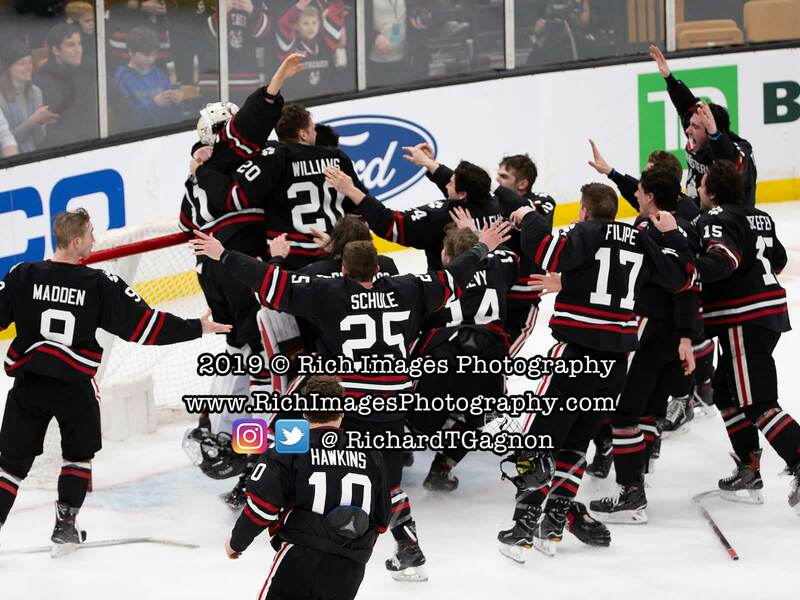 Lincoln Griffin then possessed the rebound and curled around the back of the cage, aiming the quick shot at Woll that Plevy cleaned up for the 1-0 lead. 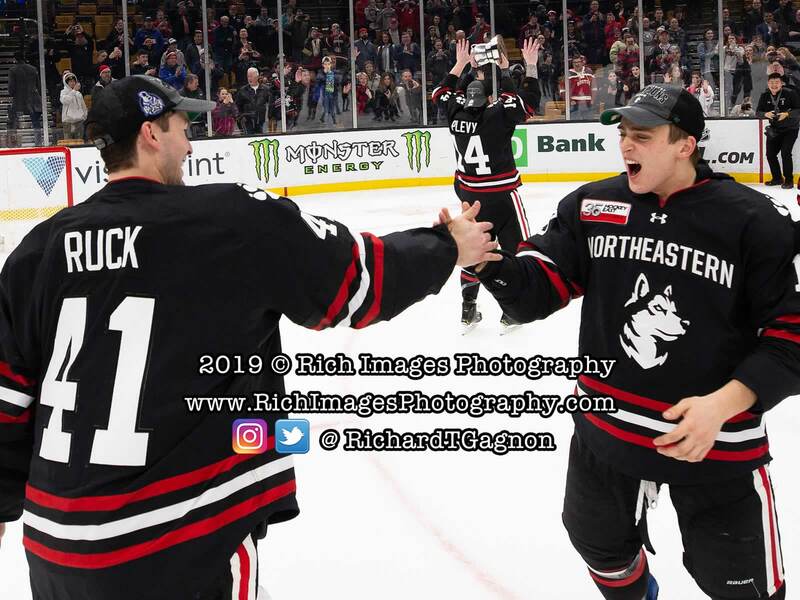 Successfully killing its only penalty of the game - Jeremy Davies' hooking infraction midway through the second period - Northeastern skated strong until receiving another late-period goal - this time from Patrick Schule. Matt Thomson played the behind-the-net pass to Schule at the left dot, where the forward ripped one to the top shelf. 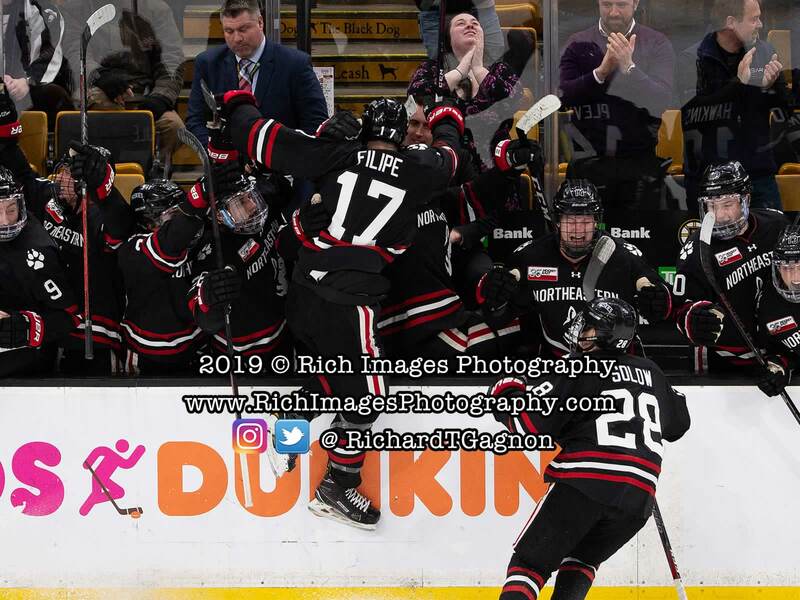 Less than two minutes into the third period, Griffin provided the Huskies with a 3-0 lead, firing the back-handed rebound of Liam Pecararo through with Woll out of position. 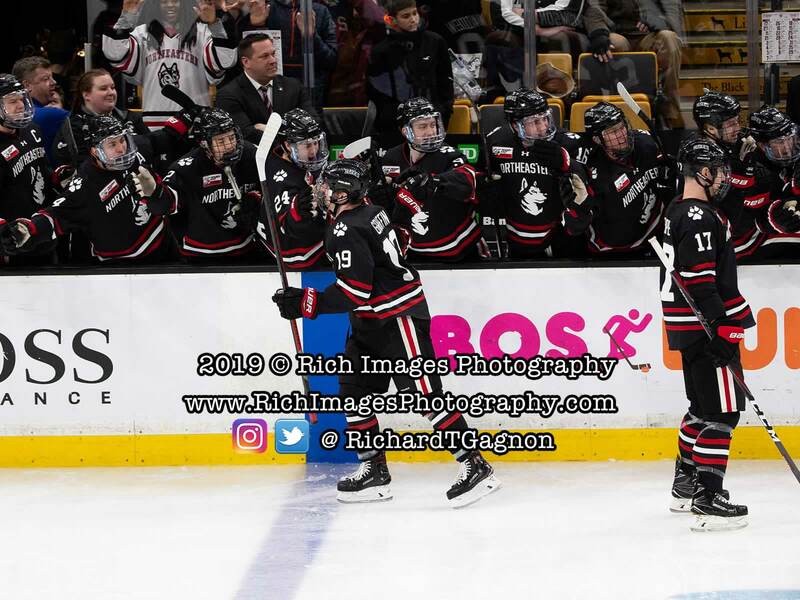 Despite Northeastern's three-goal edge, Boston College (10-4-3) made things competitive during the third period, earning goals from David Cotton and JD Dudek. 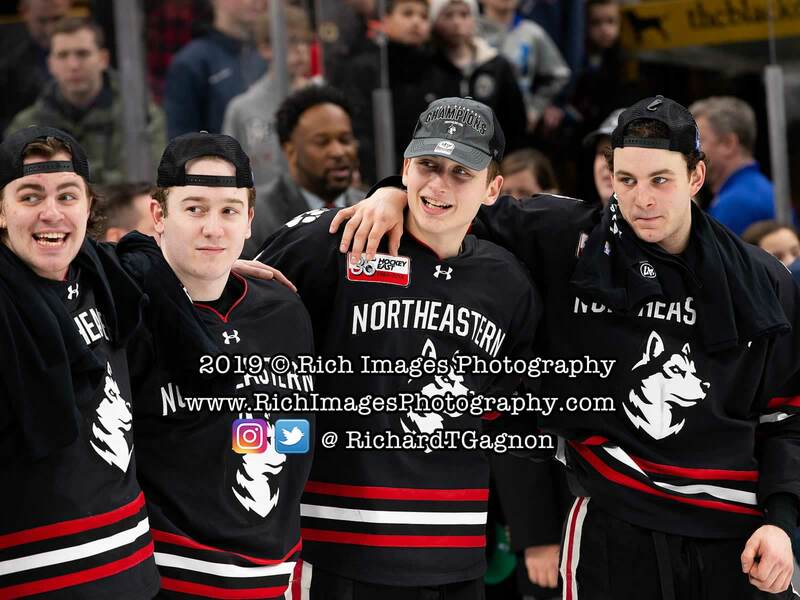 Riding the strong goaltending of Primeau down the stretch, the Huskies denied the Eagles the potential game-tying goal, securing the title with Zach Solow's empty net goal with six seconds remaining in regulation. 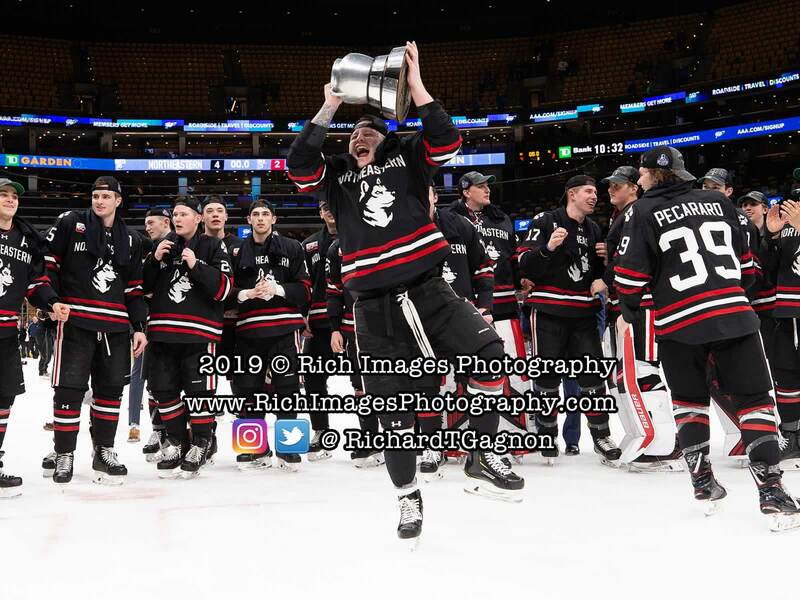 - Northeastern is the first school to win consecutive Beanpot titles since Boston College won five in a row from 2010 to 2014. 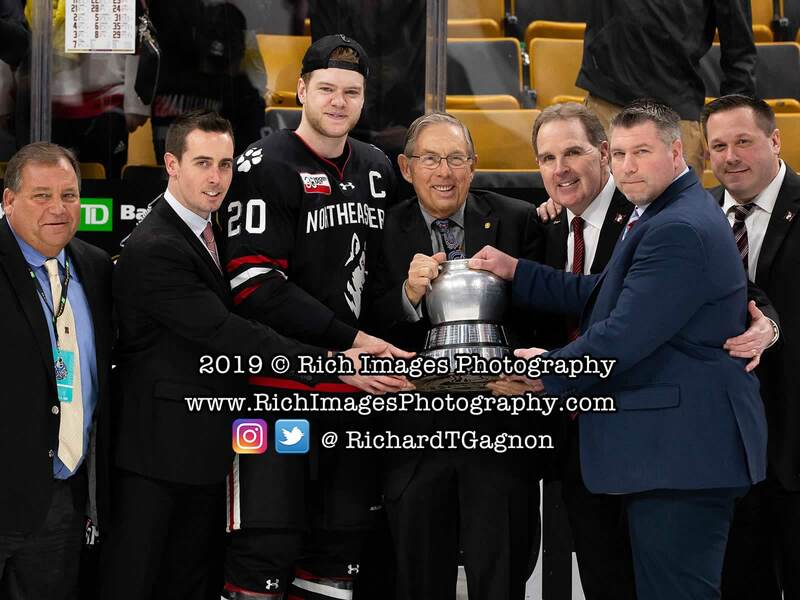 - Jim Madigan has now played a part in five of the Huskies' six Beanpot titles, winning two as a player (1984, 1985), one as an assistant coach (1988) and two as a head coach (2018, 2019). 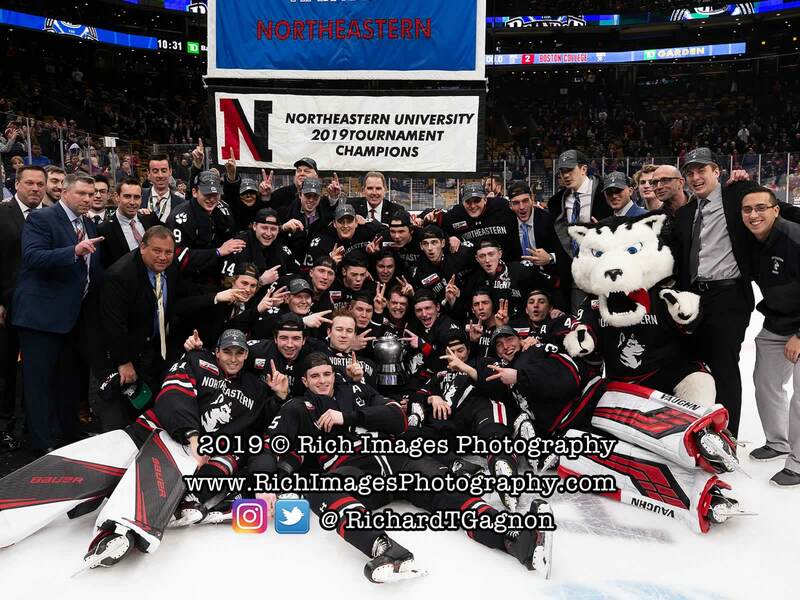 - Monday's victory marks Northeastern's first championship game win against Boston College since the Huskies' first-ever title during 1980.